Now in Paper! Without a doubt, this is the most comprehensive home-cooking reference book on the market. 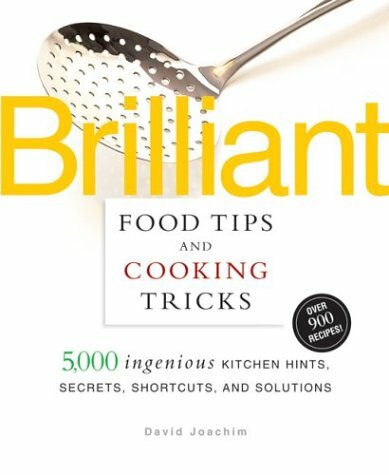 Proven cookbook editor and author David Joachim, who has appeared on the Discovery Channel, TV Food Network, QVC, and National Public Radio, has teamed up with five cooking gurus, each with a distinguished area of expertise. The combined kitchen know-how of these experts makes this volume like a complete cooking school in one volume, with master classes in each of the fundamental areas of home cooking: cooking essentials (buying, storing, and preparing foods); problem-solving; saving time; achieving and boosting flavor; and healthy cooking. More than 5,000 innovative tips show readers how to do everything, from cooking the perfect turkey to getting the seeds out of a pomegranate the easy way. Divided by sub-heads, the A-to-Z entries are illuminated with more than 170 step-by-step illustrations and 200 sidebars. With more than 900 newly developed recipes, this will quickly become an American cooking classic.